Things have been a bit crazy at the ADD House. D gave us quite the health scare and spent time in the hospital. He is home but not back at work. He should go back later this week. This month is Go Red for Women but in our house, we are remembering the importance of heart health in general. I'd like to keep my sweet heart with us for a long time! That means we (D and I) are committing to each other to cut out the soda (that's him more than me!) and start exercising on a regular basis. These are our first steps to getting everyone healthy again! Meanwhile, we still get to have a bit of fun with Iron Chef Mom! This week, our hostess is Lemons for LuLu and our featured ingredient is White Chocolate. 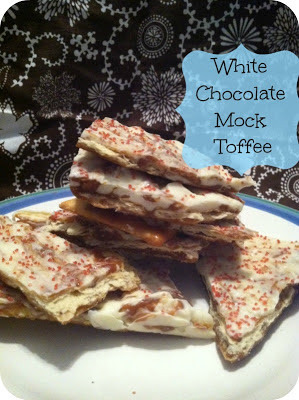 Head on over there to link up your favorite White Chocolate recipes and maybe you'll be crowned the next Iron Chef Mom! Next week, our ingredient is Cream Cheese and wow...I can't wait for that one! 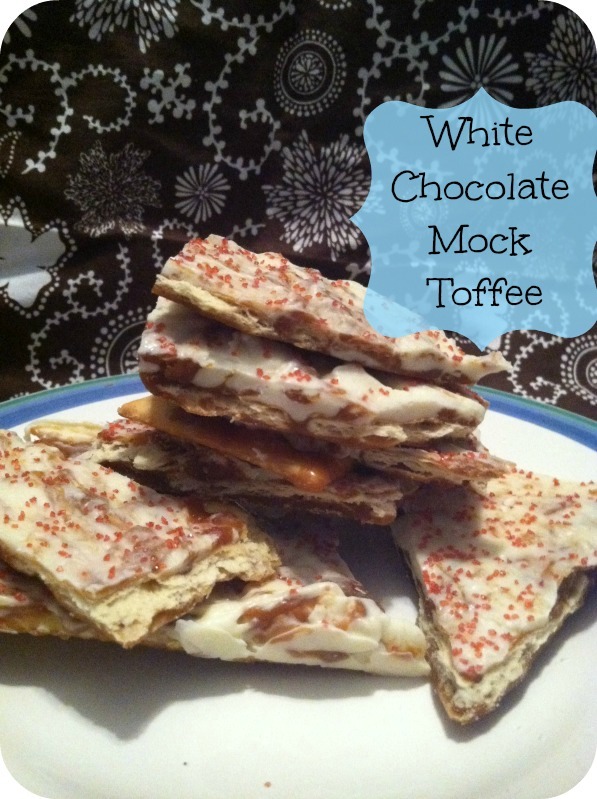 This week, with everything going on, I decided to do a fun and fast recipe the kids could help with: Mock Toffee. In pan over medium heat, blend butter and brown sugar. Heat to boiling and boil for 4 minutes. Cover a 10"x15" pan with foil and butter lightly. Place single layer of saltines on foil (close). Pour butter mixture over crackers; spread evenly.Bake at 375 degrees for 5 minutes. Refrigerate until cool. Break into pieces and store in tin container. Can be kept in refrigerator for 1 to 2 weeks. Makes 3 to 4 dozen. Ok, I really, really need some of this right now. I've been writing reports for the past 12 hours. I can't remember the last time I bought saltines, but I might have to get some for this recipe. Pinning now! Sounds great!! Pinned ;) Thanks for sharing!! This is so easy and soooo good. Thanks for sharing on Foodie Friends Friday.